Eagles owner Jeffrey Lurie holds up the Super Bowl trophy next to former Eagle Brian Dawkins before the Super Bowl banner was unveiled. Lightning and rain may have delayed the moment, but nothing could take away from it. Fireworks fly past the Eagles Super Bowl banner ahead of Thursday’s game. 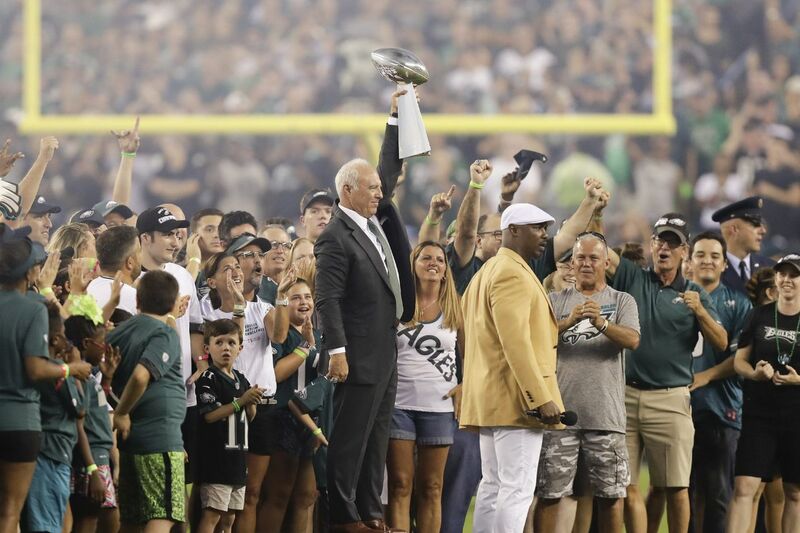 Prior to the unveiling of the banner, team owner Jeffrey Lurie and new Hall of Famer Brian Dawkins took the field with the Lombardi Trophy to get the crowd fired up. After one more raucous E-A-G-L-E-S chant, the curtain came up. One fan captured the roar of the crowd upon the unveiling.